Stanford finished 3rd, 7 shots behind Oklahoma State and 2 behind Florida at the challenging Isleworth CC, home to a number of top professionals including Tiger Woods. Sihwan Kim led the way with rounds of 70-74-68, finishing 2nd individually, 1 shot behind the Bud Cauley -- Sihwan's finish was highlighted by his tournament low final round 68 in tough conditions. Sihwan's final round included 6 birdies and only 2 bogies. Junior Sihwan Kim was runner up by just one stroke on the individual ladder. Kim entered the final round tied for fifth place but drained six birdies to threaten the tournament individual winner, Bud Cauley of Alabama. “Hopefully all of this will continue for Sihwan,” Ray continued. “I am seeing more and more of the Sihwan that we all know and love coming back.” Here is the complete Stanford Daily article. Steve Ziegler finished 19th with rounds of 68-74-81, David Chung finished tied for 29th shooting 82-77-68, Andrew Yun tied for 33rd after rounds of 71-75-82 and Jordan Cox was 72nd with rounds of 80-81-85. ASU finished 12th 24 shots behind Stanford and Washington was 13th 25 shots behind the Cardinal. Located in Windermere, Florida, the tournament invited many of the nation's top teams. Complete scoring live can be found at golfstatresults.com. 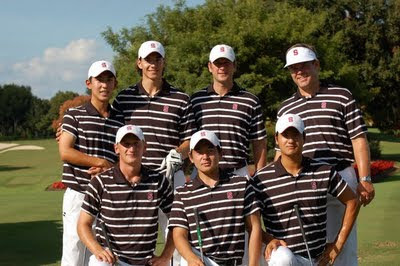 Here you can view a terrific collection of practice round photos of the Stanford team. Here you'll find the main tournament website - http://www.isleworthcollegiate.com/. Stanford finished in 2nd place, 16 shots behind TCU which was led by a sparkling 12-under par tournament by Daniel Jennevret who finished 6 shots ahead of the 2nd place finisher. Washington, UCLA and Southern Cal finished 3rd, 4th and 5th respectively. The tournament was held at the famed Pete Dye-designed Stadium course at PGA West in La Quinta, CA. The Cardinal was led by sophomore David Chung who tied for 3rd individually with 3-under par rounds of 71-71-70. Sihwan Kim tied for 8th after firing rounds of 68-72-75. Senior Jordan Cox had a solid showing tying for 18th after rounds of 72-74-73 in his first tourney of the year, freshman Andrew Yun tied for 34th with rounds of 73-79-71 while returning All-American Steve Ziegler shot 71-79-74 to tie for 37th. Four individuals participated as well led by Graham Brockington and frosh Steven Kearney who both were 14-over par at 230 to tie for 57th, frosh Andre DeDecker tied for 66th with a 232 total and sophomore Wilson Bowen finished 78th with a 244 total. Next up for Stanford will be the Isleworth Collegiate in Windermere, Florida, Oct 23-25 played on Tiger Woods' home course against a field including most of the nation's top teams. Complete scoring can be found at http:/www.golfstatresults.com. Stanford brings a full team to the year's 2nd event -- the 5 players whose scores counted for the team competition were Jordan Cox, Sihwan Kim, Steve Ziegler, David Chung and Andrew Yun. Also playing were Graham Brockington, Wilson Bowen and freshmen Steven Kearney and Andre DeDecker. Missing is injured senior captain Joseph Bramlett. Central Florida (61), Hawai'i (213), Long Beach State (na), Pepperdine (46), Notre Dame (55), Univ. of San Diego (110), Stanford (60), TCU (20) UC Davis (73), UCLA (na), USC (10), Washington (5), Vanderbilt (48). (NOTE: There will not be an SID on site this year, however, feel free to contact me if you have any questions).